In our new 'Christmas Cracker' series, each morning through to Christmas we will bring you a top insight from one of our contributors. These will be diverse and could be a macro call, sector view, stock idea, or even some useful tech. Today's insight is from Dawn Kanelleas, CFSGAM. You don’t need to build an app to benefit from the data revolution. Over the past 24 hours, many of us would have checked our iMessages, our weather app and our social media, tapped our Opal cards, used Paypal or online banking to make payments, ordered UberEats or watched Netflix. More data has been created in past 2 years than in the entire previous history of the human race (source: AnalyticsWeek, March 2017). That we rely on technology is obvious. What may be less obvious however, is that technologies like these, are underpinned and supported by data centres, which present a compelling investment opportunity for equities investors. Next DC’s services are in demand because on-premise hosting simply can’t keep up with digital transformation. In its last result, Next DC delivered an impressive 33% revenue growth and 77% increase in EBITDA. They have offered predictable and recurring operating cash flow underpinned by long term customer contracts and their growing data demands. This recurring operating cash flow allows Next DC to confidently reinvest capital in even more capacity given the growth in demand, and deliver shareholder returns for the foreseeable future significantly above its cost of capital, making it a very attractive investment proposition. Next DC offers customers scalability and flexibility with respect to their IT spend. Typically customers face significant capital investment within in house solutions like maintaining servers on their premises, but by shifting this capital spend into a shared infrastructure environment like that provided by Next DC, they are able to flex that expenditure, from sunk capital expenditure, to operating expenditure that moves according to their daily requirements and needs. The Next DC offering is also compelling to customers because it gives them access to a data ecosystem, which is a hub of interconnectivity, creating an ideal environment to connect to all suppliers and business partners in the one place, reducing costs and minimising latency while increasing level of integration. 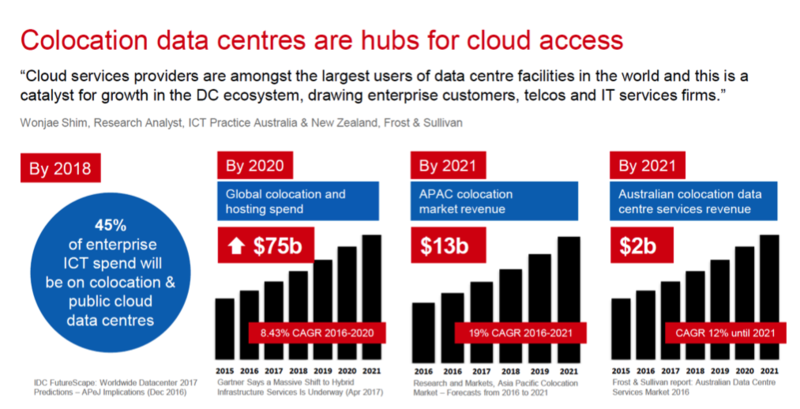 Cloud providers like Amazon’s AWS and Microsoft’s Azure prefer ‘carrier neutral’ data centres because their customers want connectivity choice. In practice this means that customers are not limited to only one telecommunication providers’ services.